While everybody’s excited about Marvel movie news this week, we must remember that at least as far as television goes, DC keeps on getting well-represented. This morning, Warner Bros. released a photo of two more characters for the upcoming series Titans. That’s not going to the CW, but anchoring their as-yet-unnamed DC-themed streaming service sometime in 2018. Let’s face it: the streaming service could have no better name than “DC Direct,” except maybe “DC Universe.” Just give in, Warner Bros., because we all know that that the back catalog of superhero movies will show up there, too — though I’ll pay extra each month not to see Steel or Catwoman. 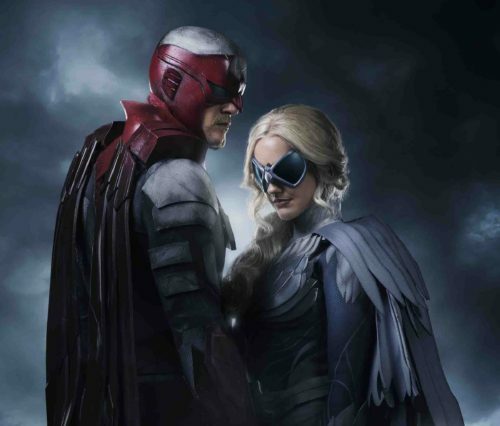 Alan Ritchson and Minka Kelly will play Hawk and Dove, though Warner Bros does not have them booked as regulars. 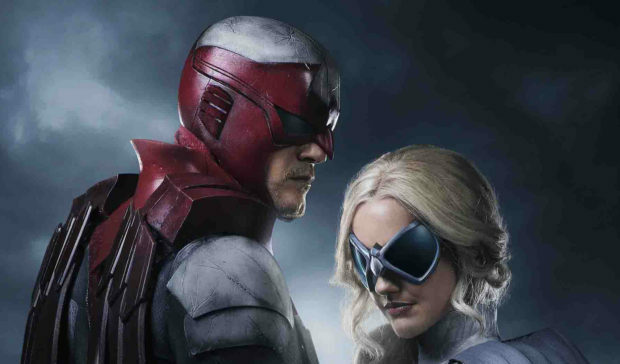 Nor, honestly, should they, because Hawk and Dove in both incarnations have always been “occasional guest-stars.” Hawk has always been Hank Hall, originally paired with his brother Don Hall as the first Dove, though who knows if the show would reference that. It’s fine backstory, but Titans has a lot of ground to cover. This version of Dove is Dawn Granger, who was gifted with the abilities of Dove shortly after Don was killed in Crisis on Infinite Earths and Hank was becoming too aggressive as Hawk without the balance. Originally created by Steve Ditko with Steve Skeates, Hawk and Dove began as a statement on the youth movement in the ’60s — Hawk literally a Hawk toward the war in Viet Nam, with Dove being a hero trying to use non-violence to solve problems. A mysterious force (later retconned as the Lords of Chaos and Order) granted them superpowers and instructed them to find a balance. They occasionally appeared in the original run of Teen Titans until losing their powers in an issue of The Brave and the Bold — but that book always had its own internal logic, as the two showed up again super-powered until Don’s death saving children from falling rubble. This isn’t Ritchson’s first foray into the DC Universe. He played the original “A.C.” (Arthur Curry aka Aquaman) in Smallville. If you want to count the Teenage Mutant Ninja Turtles since they occasionally cross over with Batman in comics and will be appearing in Injustice 2, this makes Ritchson’s third role in the DCU — for he plays Raphael in the Michael Bay reboot of the Turtles. Maybe best known for her role in Friday Night Lights, Kelly has nary dipped a toe into the waters of science fiction and fantasy. But she’s a good actor, and this could be a great part. The costumes are great — somewhat realistic but far more respectful of the comics than we would have gotten even a decade ago — and definitely in line with the look we got at Robin last week. Designed by Laura Jean Shannon, these are just some of the best comics to TV suit adaptations around. This also bodes well for Black Lightning, coming to the CW next month, for which Shannon also did costume design.